If the message list in the Outlook Express folder is empty or a part of the messages is disappeared for unknown reasons you are to recover this Outlook Express folder. How to recover Outlook messages if Outlook Express messages disappear? How to recover Outlook Express dbx file? You need a special data recovery utility for recovering for recover outlook mail. Using this utility, you can recover messages stored in the Outlook Express folders and recover outlook mail. For example, in case of a serious computer failure the Inbox folder became unreadable, and you see that the message list is empty. Or Outlook Express messages disappear. How to recover the Inbox folder and return a part or all the messages stored in it? To recover Outlook Express folders you should download and install the special OE-Mail Recovery (download) tool. OE-Mail Recovery being run, it will determine the Outlook Express storing folder by itself. The file list from this folder will be displayed on the left software panel. The files names in the list will be the same as the folders names in Outlook Express. For example, the inbox.dbx file corresponds to the Inbox folder in Outlook Express. 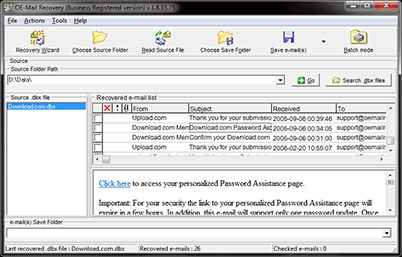 The data (messages and news) and Outlook Express service information are stored in files with the .dbx extension. Select the inbox.dbx file in the list and run the recovering process. The recover process takes considerable time and depends on the file size and computer power. It is necessary to save the messages by the end of the recover process (available n the OE-Mail Recovery registered version only). Open the folder with the inbox.dbx file in Windows Explorer (you can copy the string from the Source Folder Path field of the OE-Mail Recovery software to the Windows Explorer address field). Make a backup copy of the inbox.dbx file and remove it from the Outlook Express folder. Run Outlook Express and left click the Inbox folder. Outlook Express will create a new inbox.dbx file automatically. Open the folder with the recovered messages in Windows Explorer. Select the messages you want to move using Ctrl and mouse buttons or Shift and cursor buttons on the keyboard. Use your mouse to drag the selected messages to the required Outlook Express folder. When moving a few messages at once, it is recommended to have Outlook Express on left part of screen, and Windows Explorer on right part of it. This sequence of actions enables you to recover the Outlook Express folders and recover email after software and hardware failures. When recovering several Outlook Express folders it is necessary to make steps 3-7 for every separate folder to recover email. You can use Batch Mode if you want recover Outlook messages from a several Outlook Express dbx files, see details: Batch repair Outlook Express. If the corrupted Outlook Express dbx file is stored in the folder unlike the current Outlook Express store folder, you must specify its location in the program by clicking the Select Store Folder button. If you use several identities you are to select the necessary one from the drop-down list of the Select Folder Path field. OE-Mail Recovery is the answer on a question: How to recover Outlook messages (recover Outlook mail)? Note: For a recovering Microsoft Outlook (not Outlook Express) mails you should use recover outlook mail tool - Outlook Recovery Toolbox.